I posted a recipe the other day for George Calombaris' baked beans that are used in this dish. Like the beans this recipe comes from his cookbook The Press Club, and like the beans it didn't quite live up to its promise. The principles are there — baked beans is a classical pairing with pork and a classic in itself — but in making both of them I found myself going against my own cooking instincts in order to stay faithful to the recipe. There are plenty of great things about this dish, don't get me the wrong. 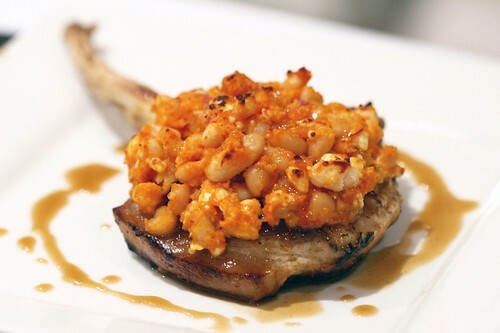 The idea of juicy pork topped with hearty beans and a salty, crispy crumble sounds great, doesn't it? What's more, Calombaris recommends serving it with a jus infused with Greek coffee, and the flavours work terrifically. Unfortunately the feta crumble topping — the very thing that sets this recipe apart from regular old pork and beans — lets it down. It didn't feel right to be mixing the crumble ingredients together with the saucy baked beans, but I did it anyway. The results were predictable: unpleasantly soggy in the middle, and poorly crisped on the outside. It's hard to believe that they would make it this way in the restaurant. Full recipe in George Calombaris' The Press Club cookbook. 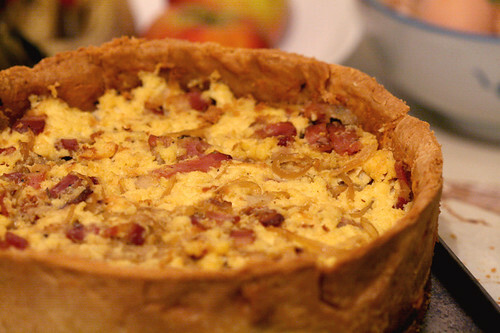 Combine bread crumbs, diced red onion, and crumbled feta and stir this through a portion of baked beans. Refrigerate until needed. Fry a pork rib chop on both sides in oil and butter until medium/medium-well. Top some of the crumble & bean mixture and grill under the broiler until browned on top. Serve with greek coffee jus. A bit disappointing really, but you haven't heard the last of feta crumble. This is a quick entry to post a baked beans recipe from George Calombaris' book The Press Club that I'm using in a couple of upcoming posts. While it won't take you to baked beans heaven — it's not even baked — it's a fairly solid recipe that can be made in bulk and frozen, eaten on its own with a chunk of bread or used to accompany pretty much anything. 1. Soak the cannellini beans overnight submerged in water. 2. Sweat the diced vegetables over a medium heat in 3 tbsp of olive oil under translucent. 3. Add the remaining ingredients (except the beans) and bring to a simmer. 4. Strain the beans and add them to the pot. Cook for 5 hours or until the beans are just tender and have absorbed the stock. There was a question on Ask Metafilter last year calling for good recipes with the fewest possible ingredients. There's some great stuff there, but where's the roast chicken? Roast chicken is the ultimate basic meal. It's filling enough to be dinner, and served with some mustard and potatoes or crusty bread you've got a complete meal with only four ingredients. As is always the case with such basic recipes, you simply can't get away with using low quality ingredients. I understand the budget-conscious mindset and will buy cheaper chicken if it's going into a heavily-flavoured curry, but for roasting you have to buy the best. Free range is a sign of quality, but if you can, ask a trusted butcher to help you choose. There are loads of techniques out there from compound butters to multi-temperature roasts, but who'd have thought the most straightforward recipe would come from Thomas Keller? Not surprisingly, it's also the best. I'm sure that at Per Se and The French Laundry he roasts his chickens suspended mid-air in a pressure-controlled bunker exactly 154 meters below sea level, but for home cooks the Bouchon method is very accessible. It will smoke out a kitchen that isn't well-ventilated, but some carbon monoxide poisoning is worth it for the crispy golden skin and juicy flesh. 1. Preheat your oven to 230ºC/450ºF. Rinse the chicken inside and out, and dry well with paper towels. Sprinkle all over with the salt and black pepper. 2. 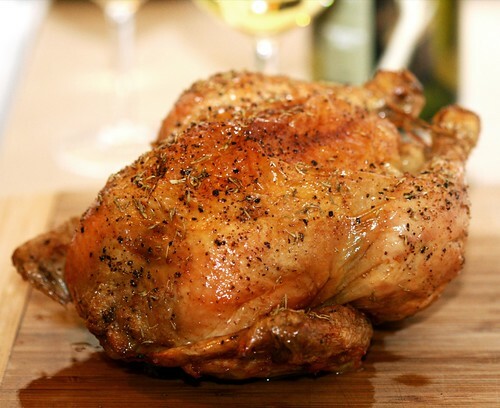 Truss the chicken and roast in the oven for 50-60 minutes, until the chicken is cooked. Test by piercing the thigh with a sharp knife — when cooked through, the juices will run clear. 3. Mix the thyme with the juices that have collected in the roasting pan, and baste the outside of the chicken with this. Rest for 15 minutes, then carve and serve.